The vast majority of this production is reaching refineries by rail not pipeline. According to the North Dakota Pipeline Authority about 60% of Bakken oil is moving by rail. Only rail networks reach into the interior of the west were the resource is located and the refineries are not. The Keystone XL project is really only important to Canada's Alberta tar sand devastation. Without radically increased transportation volume most of Alberta's bitumen is uneconomic to develop; Canada, not the US, needs the Keystone Project to be finally approved. Consequently, carloads of crude oil have skyrocketed. In 2008 just 9,500 carloads moved by rail. In 2013 carloads originating in the US will near 400,000. The gigantic tank train explosion that blistered Lac-Mégantic, Quebec last July killed 47 people and spilled 1.6m gallons of crude oil. This hellish incident demonstrates transportation of oil by rail is not without risks. One of those risks is the continued use of obsolete tankers called the DOT-111. The 1960's design was upgraded and improved in 2011 by the industry, but it only applies to new tank cars ordered after October 1, 2011. To date about 14,000 cars using the new standards have been built. About 78,000 older cars remain on the rails. 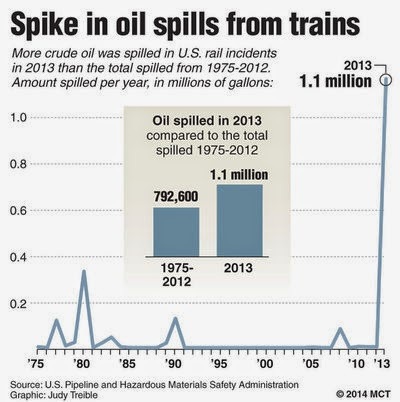 Despite outdated equipment the railroads have a better safety record than pipelines. According to US Department of Transportation data, pipelines spill nearly three times more crude oil than rail. During 2002-12 there were 148 incidents involving release of crude oil from railroads including 109 spills of less than five gallons. Railroads are required to report every release. Pipelines only are required to report releases of more than five gallons; in the same period there were 1,785 pipeline spills of more than five gallons. That is 45 times the number of rail incidents. Despite the good record the agency advised railroads to stop carrying oil in the older model tank cars. Canada has banned them beginning in 2017. Natural gas is designated the "go-to" fuel for electricity production until, perhaps, politics allows renewable energy to shoulder the load. Natural gas now accounts for 28% of US electricity generation. Coal still tops the list of fuels at 39%. Coal trains that present their own environmental problems are decreasing in number. In 2012 the US originated the lowest annual number of coal carloads since 1993. So now you know why US says: take the train.